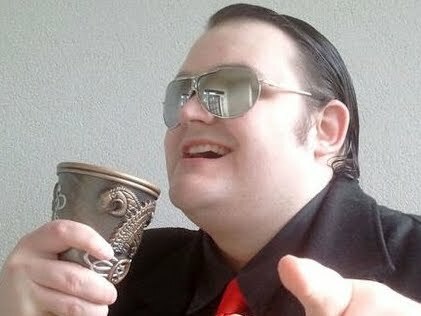 There just aren't enough hack n' slash RPGs on the market these days. 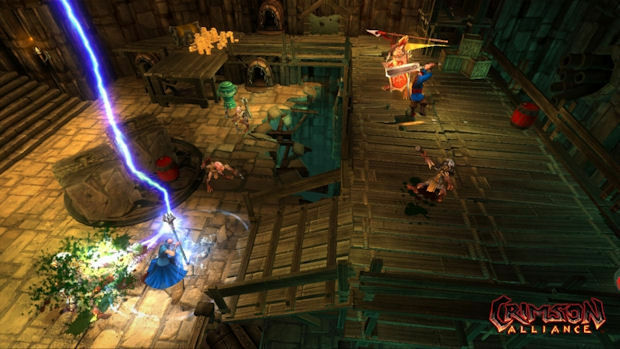 Sure, we have Torchlight and Dungeon Siege III, with Diablo III on the horizon, but there's room for more. Crimson Alliance hopes to scratch that itch a little bit, offering some traditional adventuring in a lighter, breezier package. It also comes in two flavors -- an 800 Microsoft Point download that lets you pick a single class, and the 1200 Point version with all three characters unlocked. It smells suspiciously like an attempt at free-to-play, but its bite-sized nature might make it the perfect snack between RPGs. Crimson Alliance tells the tale of three heroes -- a wizard who's lost his memory, a selfish mercenary, and a wisecracking assassin, as they travel the realm in a bid to stop the Soul Siren -- an ancient and evil queen who has returned to do ancient and evil things. Told through a series of still images and featuring voice acting that sounds recorded on an amateur level, one could be forgiving that thinking Crimson Alliance isn't very good. Surprisingly, however, there's a solid little hack n' slasher under the initial presentation. 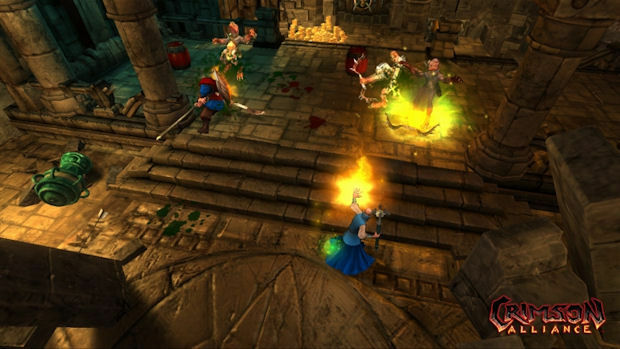 As one of three classes, players fight their way through a series of dungeons packed full of secret areas, mountains of gold, unique weaponry, and aggressive monsters. 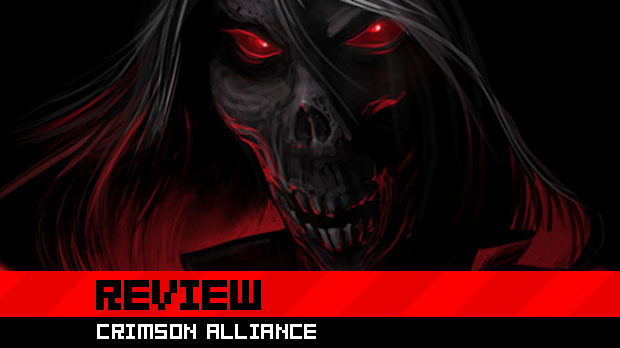 While not as deep as Torchlight nor as refined as Diablo, Crimson Alliance provides some suitably endearing button mashing combat. Played from a traditional isometric perspective, each face button corresponds to a different attack. The Assassin, for example, slices with her sword using X, stuns multiple opponents with Y, throws daggers with B and dashes with A. Each command has a very distinct use, and different attacks often work together -- the Stun + Slice combo, for example, allows the Assassin to perform a powerful finishing move. In addition to basic commands, players can also make use of disposable items that provide incredibly useful advantages. 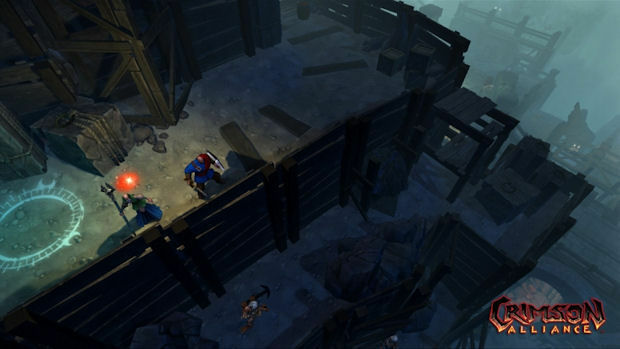 Monster Bait lets the player throw a chop on the ground, which draws enemy attention. The Turret fires a hail of bullets at nearby targets, while the Throwing Axe sends fiery shards at surrounding foes. Finally, the Healing Tower does exactly what its name implies -- radiating intermittent health orbs. Pressing the right bumper initiates Ultimate Power, which slows down time and allows the player to unleash a devastating flurry of blows. 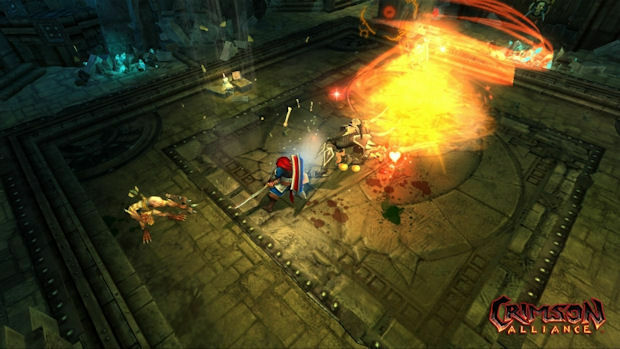 This power is crucial during the game's most intense moments, where dozens of enemies pour from every hole in the wall. Naturally, the game supports co-op, which can be enjoyed by four players locally or via Xbox Live. A number of optional puzzles in the game require at least two players, what with the pressing of switches and whatnot. While it's a cool addition, it does mean that those playing solo are missing out on some cool extra gear, so it's recommended you get a friend to tag along. Unlike most RPGs, Crimson Alliance completely does away with experience, leveling, and stat management. Instead, the only way to improve is by obtaining and equipping new weapons and armor. While some can be found in dungeons, the most powerful are bought from merchants that litter the stage selection map. These items are pretty expensive, and gold takes quite some time to acquire. This is where the game attempts another artificial free-to-play trick, with an in-game option to buy 40,000 gold pieces for 80 Microsoft Points. Although not essential, it looks a little insidious, not least because obtaining the gold without spending fake money that you bought with real money requires one to replay old levels at least half a dozen times. That little issue notwithstanding, Crimson Alliance is an unexpected amount of fun. Although the first couple of levels feel rather dismal and dreary, it doesn't take long for the action to really ramp up. As levels get brighter and more interesting, so too does the combat grow evermore intense. There's a good amount of enemy variety, and opponents can be quite challenging, each with their own strategies for defeat. The endless button mashing can get a little tiresome, however, making this a game best played in shorter chunks as opposed to lengthy, all-out sessions. The biggest complaint one can have about Crimson Alliance is that it's a fairly shallow affair. While enemies do require a healthy combination of skills to take down, once you know the best way to dispatch a foe, you'll be doing it over and over again. The inability to grow skills and develop characters beyond equipping new gear means that the focus is squarely and solely on pummeling monsters, which is certainly enjoyable, but leaves one feeling a little empty once it's all said and done. By the time you've thrown dozens of daggers at your twentieth voodoo priest, it gets a tad old. Crimson Alliance's ultimate strength lies in the flexibility of its pricing. For 1200 MS Points, there's just not enough gameplay on offer. However, picking a single class for a considerably cheaper 800 Point experience is a wonderful alternative. You essentially get the full game, and since I feel there's little value in replaying with a fresh class, it's basically the perfect choice. Classes are traditional enough that any RPG fan should already know what character they want, so there's not even a risk of feeling like the wrong purchase was made. While it could definitely have used more meat on its bones, Crimson Alliance is a fine little game that does just enough to provide a few hours of solid fun. It's got a bright and fun visual style, an encouraging level of challenge, and should be the perfect way to keep one's sword sharp while waiting for Diablo III to turn up. You can't say fairer than that.